Rightside had to sell and Donuts is the logical buyer. Last week, Donuts agreed to acquire Rightside (NASDAQ: NAME) for $213 million. As luck would have it, I was vacationing in Costa Rica when the deal was announced. I gave some initial thoughts right after the news broke, and now I’ve had more time to think through the deal and the ramifications. There was no question that Rightside was going to be acquired or go private in some way. After selling eNom to Tucows for $83.5 million earlier this year, the company was just too small to remain public. It also had lots of pressure to perform, and the numbers weren’t heading in the right direction. It had to sell eNom because it was about to lose its biggest customer. This move increased the attention on new top level domains, and new TLD revenue was stalling. Revenue grew as the company launched top level domains, but stalled once the funnel of new domains dried up. 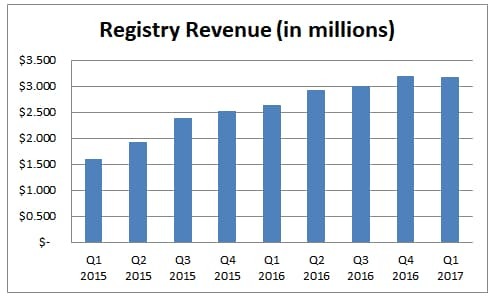 The company continued to forecast $50-$75 million of registry revenue per year within a few years time, and that was going to be a very difficult target to hit. The company also faced headwinds with the unpredictable revenue stream it made in the domain name aftermarket, and predicted lower overall revenue in 2017 than 2016 thanks, in part, to the aftermarket. Donuts and Rightside have been partners since the beginning of Donuts’ history. The two companies applied for a pool of roughly 100 domains together through a partnership, and some people even suspected that Donuts was acting as a backdoor in case Rightside (then part of Demand Media) was disqualified from owning new top level domains. Rightside also runs the technical backend registry services for all of Donuts’ domains. One of Donuts’ founders and its first CEO, Paul Stahura, founded eNom, which was later purchased by Demand Media and became part of Rightside. It hasn’t always been a peachy relationship, though. There was Donuts’ unsolicited $70 million offer for Rightside’s registry business, which Donuts made public after it was rebuffed by Rightside. Donuts also seemed to use Google’s open source registry as a way to negotiate a good deal when renewing its registry contract. Donuts’ $213 million offer is a lot more than its first $70 million offer, but there are a couple of things at play here. First, this is for the entire business, not just the registry business. For now, the registry business is the smallest part of Rightside. Registry generated $11.8 million last year. Donuts also gets retail registrar Name.com and Rightside’s portfolio of about 300,000 domain names. The registrar generated $29.1 million revenue last year and aftermarket (which includes the portfolio and parking revenue) generated $22.6 million. To be sure, the registry business has much higher margins than the business as a whole. Rightside also has a ton of cash after selling eNom. It started to use some of it for buybacks, but the $213 million offer net of cash is probably closer to $150 million or so. It will be interesting to see what Donuts does with the registrar and aftermarket business. So far it has avoided the conflict of interest of owning a registrar, but vertical integration between registries and registrars hasn’t ended up being as big of a deal as some predicted. Rightside has leveraged Name.com to boost some of its own TLDs, so perhaps Donuts will decide to keep it. If not, there are probably a lot of willing buyers. The aftermarket business is a different matter. It would be kind of funny for Donuts to hold onto this business and its hundreds of thousands of .com domains in light of its new top level domain mission. I don’t have much insight into what’s in the portfolio, but GoDaddy would be a logical buyer for the “clean” part of this portfolio. Donuts was already the big dog in the new TLD game with about 200 domains. It’s now even bigger. Donuts and Rightside took different approaches to new TLDs and it will be interesting to see if Donuts shifts. Historically, Donuts has done little to market its domains. It’s an economies-of-scale business. Rightside is different. It has marketed its domains. It had no choice because it had to show topline growth, even at the expense of profits. Rightside cultivated certain top level domains. For example, it used streaming video influencers to grow .live. Will Donuts drop all of this activity in favor of harvesting Rightside’s efforts to date? Honestly, this might make more financial sense than plowing money into marketing. For the sake of the industry, I hope Donuts ramps up its marketing. I just don’t know if the numbers will add up. Donuts doesn’t have the same short-term pressures that Rightside had as a public company. Both Donuts and Rightside also took an analytical approach to premium domains, but Rightside took it overboard. Will Donuts pare Rightside’s premium inventory? From a trademark protection standpoint, expect the two companies’ similar trademark blocking services to be combined (and sell at a higher price). Despite recent layoffs, Rightside still has a lot of overhead. A lot of positions are now redundant with Donuts. Depending on the strategy Donuts takes going forward, now would be a great time for domain industry companies looking to bolster their ranks to take a look at some of Rightside’s staff. Rightside had no choice but to sell. Donuts was the ideal buyer given the existing partnership and Donuts’ role in the new top level domain business. Two things to watch are what Donuts does with Rightside’s non-new TLD businesses and if it changes its marketing approach. Considering those are already established and marketed, it is a very good value for money indeed. Today I look it from Donut’s prospective of what they are paying for a nominal average .TLD. This can be seen as another way to value registri.es. That’s fair. Just pointing out that the historical net outlay for new TLDs is lower than the auction prices might suggest. Donuts Inc IPO on the horizon?